Our Data Cards & Magnetic Holders make it easy to create custom messages for your office dry erase whiteboard, as well as markers in your file cabinet to separate and organize records. Data cards come in a wide range of styles and colors that you can easily cut in any size or shape you need. 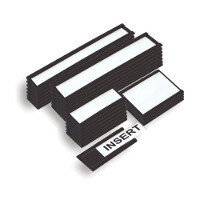 Magnetic Cardholders come in individual units and rolls that are easy to cut to hold data cards of all sizes. Order today and keep your office on target and in order.